We have 4 time-isolation units available with programmable dynamic lighting system for studies involving humans at the Faculty of Mathematics and Natural Sciences of the University of Groningen, The Netherlands. 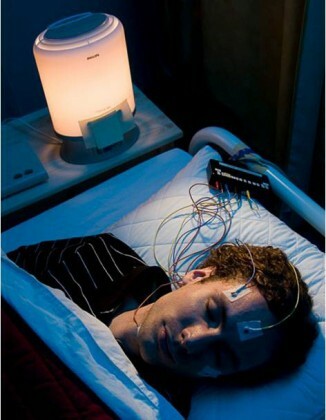 The laboratory is equipped with sleep EEG. body/skin temperature sensors, a tailored battery of cognitive tests, and pupilometry equipment is available. We are able to collect ambulatory data of rest-activity and light exposure, sleep EEG, body/skin temperature, tailored online/offline diaries, questionnaires and cognitive tests. With the help of a spectroradiometer we perform a complete light scan of the environment and translate this information into its potential non-image forming effects on physiology, alertness and behaviour. In collaboration with the Faculty of Mathematics and Natural Sciences of the University of Groningen, The Netherlands, we have an Endocrinology laboratory and an Isotope laboratory available for biomarker analyses. We have highly experienced personnel and we take part in inter-laboratory comparisons. We analyse salivary melatonin rhythms (RIA), urinary 6-sulfatoxy melatonin patterns (ELISA), and salivary cortisol rhythms (RIA). For other analyses please contact us. We support scientists and PhD students who study 24h rhythms in humans. Evaluate non-image forming effects of light on sleep, melatonin, cortisol, mood and performance in late chronotypes. Evaluate the effects of a dynamic lighting pattern on sleep, mood, and medication used in the demented elderly within a longitudinal 2 year-follow up nursing home study. Evaluate sleep problems and sleep timing in (patient) populations by means of questionnaires. Perform a light scan of a 24h working environment and report on potential physiological and behavioural effects around the 24-hour cycle, e.g. effects on alertness, melatonin concentration, and cortisol concentration.